← HAPPY INDEPENDENCE DAY FROM EQMM! Ten Days’ Wonder, paradoxically, is both Queen’s greatest triumph and Ellery’s worst failure. Ten Days’ Wonder could easily be subtitled “A Study into Blackmail and Other Forms of Manipulation.” It opens in September when sculptor Howard Van Horn, a slight friend from Ellery’s prewar past, looks up the Great Detective out of fear. What might Howard be doing during his periodic blackouts that can last for weeks and span hundreds of miles? Ellery agrees to investigate, and just as Howard is leaving they remember that Ellery still needs Howard’s address; Howard rips a page from a notebook in his pocket, jots the address, hands it to Ellery, and leaves. When Ellery scans the note, he is stunned. Howard lives in Wrightsville, the site of two previous Ellery adventures, Calamity Town (1942) and The Murderer Is a Fox (1945). In both those cases, Ellery reached difficult and unpleasant solutions that were never shared with the general public. So for the third but far from final time, Ellery tackles a mystery in Wrightsville. Wrightsville is a fictional small town in New England, lovingly created by Queen as a physical and spiritual refuge for big-city Ellery (and perhaps for the authors themselves). The main square of town is a circle, from which five streets radiate, like spokes from a wheel, leading into the various shopping and industrial areas. Farther out are the residences, with the fanciest ones up on The Hill. Some characters reappear from one Wrightsville case to the next. Others move away, retire, or die. Ellery has worked closely before with Doc Willoughby and Police Chief Dakin. To the Van Horn estate arrives Ellery, ostensibly to work on his latest book, and there he meets: Howard’s father, Diedrich, a self-made millionaire and civic philanthropist who has read all of Ellery’s books and keeps them on the shelf; Diedrich’s unlovely brother and shrewd but nasty business partner, Wolfert; and Diedrich’s endearing though young-enough-to-be-his-daughter wife, Sally. Those three plus Howard and Ellery are the five main characters, an unusually small cast for Queen, but one which allows him to explore and focus on the characters more deeply than in any Queen book before or since. Also in the household are Diedrich’s and Wolfert’s nonerian and more than slightly senile mother, Christine; plus some hired help; but they are not meant to be suspects or major players. Soon after Ellery arrives he learns that somewhere behind the scenes, out in Wrightsville, is a blackmailer—or is the blackmailer inside the house? During his stay Ellery, quartered in the Van Horn guest cottage, works on his novel, battles the unseen blackmailer, and tries to make sense of Howard’s increasingly baffling behavior. One day Ellery runs through Wrightsville trying to track down the blackmailer; that night he follows a sleepwalking Howard to a particular cemetery grave, where Ellery’s skill at anagrams provides a vital clue. But two idiots in love refuse to follow Ellery’s advice to let the truth come out and to refuse to submit to the blackmail. Thus they play into the blackmailer’s hand, using Ellery as a reluctant go-between, first as a bagman, delivering a cash payment. But, as Ellery had predicted, the blackmailer’s demands get larger, and eventually a $100,000 (more than $1 million in today’s money) diamond necklace is taken from the household safe. A disgusted Ellery, proclaiming this his final participation in the blackmail business, pawns the jewelry for $25,000 and again serves as bagman to pay off the blackmailer. The necklace is discovered missing, the police are called in, the pawnbroker steps forward to return the necklace, and Ellery is left holding the bag—that is, identified as having pawned the item, but having no way to prove that he himself is not the thief. Only Diedrich’s willingness to dismiss the incident without pressing charges, and to repay the pawnbroker for the $25,000 shelled out, keeps Chief Dakin from making a reluctant arrest of Ellery, who waits in vain for the blackmail victims to explain how he came into possession of the jewels; but they more or less whistle and look away, more concerned with obeying the blackmailer than with coming to Ellery’s aid. Ellery, meanwhile, keeps his promise of silence about the blackmail but then immediately exits Wrightsville, knowing the blackmail victims no longer deserve his help and washing his hands of all the Van Horns. But on the drive back to New York a minor detail triggers the Ellery mind. Suddenly he sees the motif, the pattern for all the crimes that have been occurring. He counts the crimes. No, not all the crimes, for one crime is missing. Let’s see, which one is it? And then it hits him. The one crime that hasn’t happened, but must happen, is murder. Only then did this reader, so caught up in the blackmail, realize that there was no murder yet. Ellery makes an emergency phone call to warn the Van Horns and races back—but too late. One of the Van Horns has been murdered horribly. Ellery discovers the body on page 185 (of the 265-page first-edition printing), already feeling guiltily responsible. Then Ellery explains to the surviving Van Horns and to Chief Dakin and other assorted officials exactly what had been happening with the blackmail and the thefts and the other crimes, how he had discovered the pattern behind all the crimes, and how this pattern led him—alas! slightly too late—to the knowledge of the impending murder. He also identifies the murderer, but not the blackmailer, for the blackmailer has masterfully outwitted Ellery at every turn, and Ellery still knows not who the blackmailer is. And this reader clapped his head in amazement, for not having seen the now-obvious pattern behind these crimes of unparalleled magnitude; and with praiseful, worshipful admiration for the sheer audacity of Queen to use this as a crime motif. The named murderer denies nothing but, before being led away, commits suicide. This time, unlike on his previous Wrightsville trips, Ellery’s full solution is published in all the papers and he is proclaimed a genius. One paper even dubs him with a nickname I won’t divulge (it would reveal the crime motif), but it simply must be the greatest pun in the annals of detective fiction. And thus concludes Ellery’s nine days on the Van Horn case; and if Ellery was a mere nine-days’-wonder detective, or if Queen was a mere nine-days’-wonder author, that would be the end of the book, on page 205. And it would have been a darned great book. But then the fun truly begins. Ellery’s great success on the Van Horn case starts a barrage of cases being brought his way, and the all-conquering hero quickly has the busiest eleven months of his life, filled with non-stop success and glory. But then Ellery decides to write again, puts on his old smoking jacket, unworn in eleven months, and there in his pocket is the piece of paper from Howard Van Horn. Only now does Ellery realize that this paper with the Van Horn address contains writing on the reverse side. It’s a page from Howard’s journal. And it changes Ellery’s life completely. Ellery painstakingly applies his best logic to the piece of paper, but the only conclusion possible is that the Van Horn murderer could not have had a certain skill needed to plan one of the many committed crimes. And if the murderer had not committed that one crime, then maybe the murderer had not committed some of the other crimes either. As Ellery unravels his whole prior glorious solution, he belatedly makes some phone calls to follow up on information given to him eleven months earlier, scrambling desperately to confirm what he’d been told but in the end refuting it. And then his grand impeccable solution is gone; it never was; he had been all wrong; and totally deflated, he returns to Wrightsville, knowing that the suicide is blood on his hands, for it never would have occurred without his “brilliant” solution, and the first death also would not have occurred but for Ellery’s manipulated participation. And Ellery exits Wrightsville unseen, the truth of the Van Horn case never to be made public. I give Ten Days’ Wonder five stars in a five-star system. (I’d give it ten stars in a ten-star system.) The only quibble you can give it is the reader needs to suspend some disbelief to allow for the basic premise of the criminal’s manipulating Ellery so thoroughly at every step, and needing to do so for the complicated plan not to fail. After all, if mere blackmail or murder were the goal, why not do it before Ellery comes to town? Or why not wait until after he leaves? No, the culprit’s plan was much vaster, almost that of an immortal. Still, because of the deep but narrow focus on the few characters, and the flawless execution of the criminal and of Queen the writer, it’s my favorite of all the Queen books. 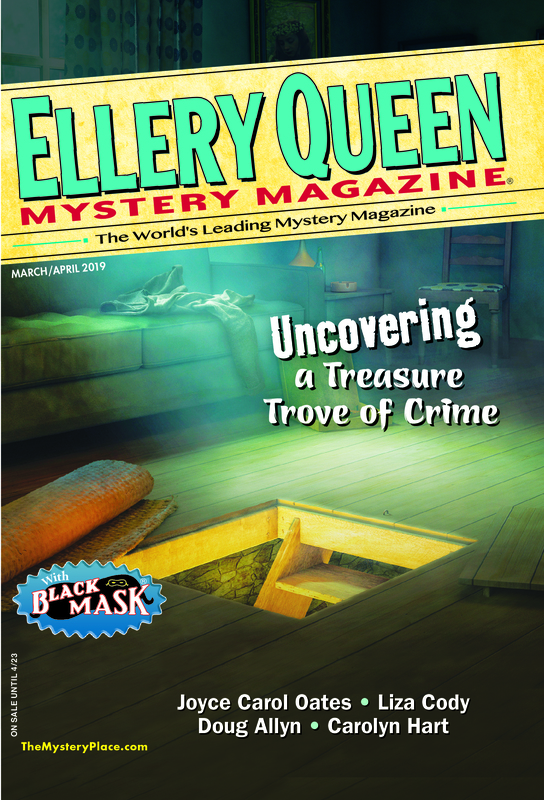 This entry was posted in Books, Characters, Criticism, Ellery Queen, Fiction, Guest, review and tagged crime, detective, ellery queen, fiction, literature, mystery, review. Bookmark the permalink.